I’m writing to give you a quick update about Boomer. He’s the sable & white male from Molly and Buster’s litter last year on March 31, 2012. At almost 1, he weighs about 26lbs and enjoys fruits and vegetables with his dry kibbles! He loves apples, pears, blueberries, broccoli, cauliflower, carrots. He’s doing wonderful and is such a joy to my family! He likes to play with my 11 & 8 yr old sons and wants to be included in their games. He loves to snuggle in bed and will lay beside me on the sofa throughout a movie. Each time we give him a pressed bone, he would look for a place to hide it. Are Cavachons fond of digging in the dirt? We’ve trained him to fetch the newspapers from the bottom of our driveway…attached is a photo of him taken today, chilling out and enjoying a cool breeze on the deck. 🙂 Thank you so much for Boomer. He’s such a GREAT dog and makes us laugh a lot! Here is a cute video of him as well. 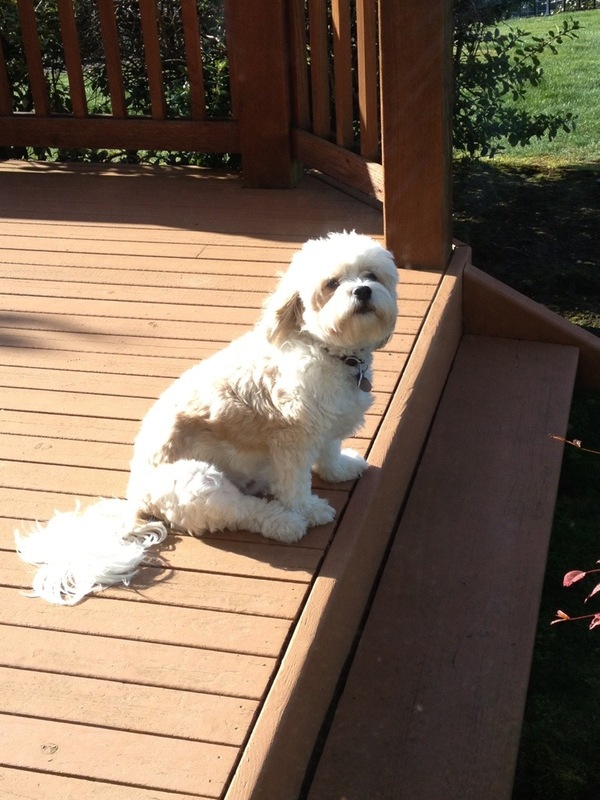 This entry was posted in Adopted Puppies, Blenheim, Buster, Buyer Feedback, Cavachon. Bookmark the permalink. Very cute shot of Boomer. Our Spreckels, sibling of Boomer, and also 1 year old today may be losing out in the food department 3 year old cousin Pebbles (26 lbs herself) as Spreckels weighs in at 17 lbs.